No change in slab rate of Income Tax. Whereas, Income Tax for individual taxpayers having total taxable income up to Rs 5 lakh is proposed to be Nil i.e. Tax rebate u/s 87 of Income Tax Act, 1961 (‘the Act’) is proposed to be of Rs.12,500/- (For A.Y. 2019-20, Rs.2,500/-) for individual taxpayers whose total income is up to Rs 5 lakh (for A.Y. 2019-20, Rs.3.5 lakh). Further, no such benefit to individual Taxpayers having total income more than Rs 5 lakh and income tax will be continued to levy under the category of 5% slab on income above Rs.2,50,000/- to Rs.5,00,000/-. Standard deduction from salaries under section 16 of Income Tax Act, 1961 (‘the Act’) is proposed to be increased from Rs. 40,000/- to Rs. 50,000/-. Amendment is proposed under section 23(4) of the Act that Notional rental income from second house property shall not be charged to income tax. Amendment is proposed under section 23(5) of the Act that the period of exemption from levy of tax on notional rent on unsold inventories from one year to two year. The period would be counted from the end of the year in which project gets completed. Under section 54 of the Act, the amendment is proposed to extend the deduction on purchase/construction of two residential houses in India, if the capital gain does not exceed Rs 2 crore, however, this benefit can be availed once in lifetime. Benefit under section 80-IBA of the Act, is proposed to be extended to one more year for housing projects under affordable housing scheme. Under section 194A of the Act, TDS threshold on bank interests is proposed to be increased from Rs. 10,000 to Rs 40,000. Under section 194-I of the Act, TDS threshold on rental income is proposed to be increased from Rs. 1.8 lakh to Rs 2.4 lakh. Income Tax Assessments to be 100% automated in two years. IT Return processing in just 24 hours. The Standard deduction has been increased from Rs.40,000/- to Rs 50,000/-. respect of the house owned too. Presently the property consisting of any building or land appurtenant thereto which is held as stock in trade and such property is not let out then the annual value of such property for the period upto one year from the end of the F.Y in which certificate of completion of construction of the property is obtained is not taken to be deemed to be let out. The relevant provisions were inserted by Finance act 2017 w.e.f A .Y 2018-19. Interest on capital borrowed for acquisition / construction of two self occupied House properties(earlier the same was available only as regards to one self occupied property) shall now be admissible as deduction, subject to the existing overall ceiling of Rs 2,00,000 p.a. Presently an assessee being an individual or a HUF is entitled to claim of deduction as regards Long term capital gains arising from transfer of a residential house property provided such capital gains are invested in ‘One residential House property’. The deadline for specified housing projects for exemption u/s 80-IBA is proposed to be extended to 31st March 2020 from the existing deadline of 31st March 2019. Rebate of 12500 is proposed to be allowed provided the total income after deduction under chapter VI-A doesnot exceed Rs 5,00,000/-. this limit was Rs 1,80,000/- p.a. applicable from 1/4/19 or 1/4/20 ??? 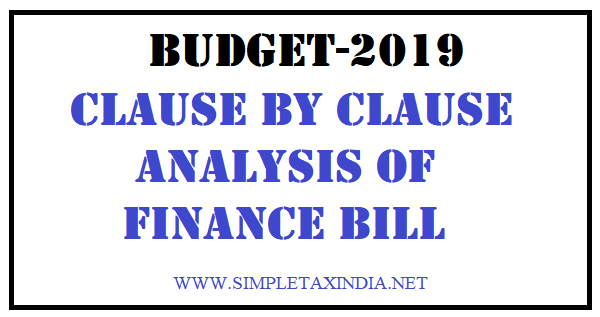 In technical term it is applicable from 01.04.2020 as the finance bill related to assessment year but in layman term it is applicable for financial year 2019-20. So date shown is correct as well as you. Any thing changed for corporate tax ? Pleas calrify , if any person sale his land & his LTCG is less than 2 crore, is he can invest in 2 residential houses to avoid LTCG tax.??? The section 54 is only applicable where property sold is residential house , so this section not applicable in land sale .